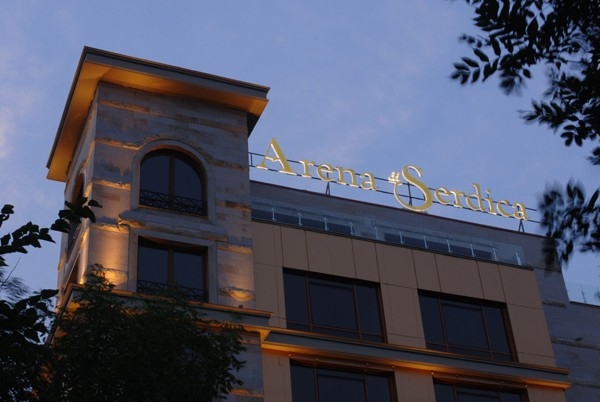 Transfer from airport to downtown hotel Arena di Serdika 5 *. Right with the entry in the hotel you will make the first encounter with the history of this city, which today bears its fourth name. In chronological order the names are Serdika, Sredets, Triaditsa, Sofia. In the hotel you will be given an unexpected opportunity to drink a cup of coffee among the ruins of the amphitheater (Arena di Serdika) built of Romans in 3th-4th century of our era. It is oval in shape with dimensions 60x43 m, only a few feet shorter than the Colosseum in Rome. Its capacity was of 25 000 spectators. You will see 7 rows of seats preserved in their original position. Walking tour to the city center (about 3 hours). You will see St.Sophia church dating back to 5th-6th century of our era, a monument of Bulgarian medieval civilization that gave the current name of the town. Visit the largest cathedral Alexander Nevski with its gilded dome, the rotunda St.George 3th-4th century and the city fortress and you will feel the atmosphere of the city, which history dates over 5000 years ago. Dinner in a folklore restaurant. There you will not only try the typical Bulgarian dishes, but will listen to Bulgarian folk music and hectic rhythms of the dynamic Bulgarian folk dances. Day 2 – Breakfast . Departure to the Monastery of Rila. Rila Monastery is one of the symbols of Bulgaria and is also a popular tourist destination. The monastery lies in the recesses of Rila Mountain, at 1147 m above mean sea level. It is located about 120 km away from Sofia. Rila holy cloister was founded in the first half of the 10th century. Its history is directly related to St. Ivan of Rila, the first Bulgarian hermit, who settled in the region and devoted his life to fasting and prayers. The monastery was initially situated near the cave where the saint dwelled. After he passed away in 946, St. Ivan of Rila was buried in the cave in which he found solitude. Tsar Peter (who reigned in the period 927 – 969) brought the relics of the wonderworker from Rila to Sredets (Sofia). It was probably then when he was canonized as a saint. The relics were returned to Rila holy cloister in 1469. The total area which the holy cloister takes, together with the church, the residential, and the farming buildings, is 8800 sq m. The monastery courtyard, the Birth of the Virgin Mary Temple, Hrelyo’s Tower, the museum, the residential and the farming buildings are surrounded by 22 m-high stone walls. There are around 300 rooms in the monastery, 100 of which are monastic cells. After the visit of the monastery a lunch in a trout hatchery in its surroundings. Return to Sofia. Time to explore by yourself the city center. Dinner. Night. Day 3 - Breakfast. Check out. Visit the Boyana Church, located on the outskirts of Sofia. It is a true masterpiece of the Bulgarian Middle Ages. Its frescoes dates from 1259 year and it was declared by UNESCO a World Cultural Heritage. You will see real treasures in the National History Museum, located in the government complex of Boyana. Its rich collections are various of ages, ranging from the Paleolithic era through to present days. You can view items of the historical, numismatic and jewelry collections and the typical Bulgarian clothing of past eras. Departure to Veliko Tarnovo. Lunch on the way to the shore of a lake in the area of golf resort Pravets, nestled in the folds of Balkan mountain, the mountain which gave the name of the Balkan Peninsula. Balkan or Stara Planina more than 190 km long and passes through the central part of the country. Beautiful green hills and tranquil landscape. Arrival in Veliko Tarnovo - the former Bulgarian capital. Accommodation in a 4 * hotel - hotel Yantra. This is a beautiful city built on hills at the foot of which the Yantra River is winding. This is the city chosen by the Second Bulgarian kingdom for its capital (12th - 14th century). Day 4 – Breakfast. Visit Tsarevets Hill, home to the Royal Palace and Patriarchy. The hill was fortified (with wall) and occupied between 12th-14th centuries. It had between 3000 - 3200 inhabitants. These were aristocrats and merchants. The royal palace was in the castle fortress. Its area is 4872 m2. Patriarchy was the second fortress of the castle, with an area of approximately 3000 m2.The church of the Patriarchy was built in 13th-14th century, on the highest point of the hill. Visit the street of the crafts - Samovodska charshija where crafts studios are still active. There is immersive atmosphere of 60th-70th years of the 19th century. Free time for visiting the city and tasting the local cuisine. famous Arbanashka jerky, dried tongs and sausages. In Arbanassi flourished and the copper processing, goldsmith, making wooden barrels, blacksmith, silkworm. Much of the population was engaged in rearing silkworm and cultivating amber grapes. To feed the worms an entire array named Chernichaka was covered with mulberries trees. The four stores for reeling produced large quantities of raw silk, which was sold in Italy, Istanbul and etc. In early spring, all the Traders with their caravans of 40-50 horses was loaded with goods and taken to the Ottoman Empire for trade as well in Italy, Hungary, Wallachia, Moldavia, Poland, Russia, in all enslaved by the Empire Balkan countries. They made it to Baghdad, Persia and India, from where were brought silk, velvet, and spice-goods, immediately sold in the stores. Until today there are 144 houses - architectural monuments such as Hadzhihristovata house, Konstantsaliev, Hadjiiliev, Kandilarov house and others. Famous for Arbanassi’s houses is that they are richly decorated ceilings and doors, carved shutters, decorative grilles and yards, protected by high stone walls, immersed in greenery. The oldest church in the architectural reserve Arbanassi is "Rojdestvo Hristovo." It was built in the late sixteenth and early seventeenth century. The largest church in Arbanassi is "St.st. archangels Michael and Gabriel", built in XVII century and frescoed in 1761 by the painters from Zograf Michael from Thessaloniki and George from Bucharest. And the other Arbanassi churches are "St. Dimitar", "Athanasios" and "George" is one of the most remarkable monuments of Bulgarian art and culture from XIV-XVIII centuries. Dinner in the atmosphere of old Arbanassi houses. Return to the hotel in Veliko Tarnovo. Day 5 – Breakfast. Check out. Departure to Etara and Kazanlak. The outdoor museum Etara is another interesting place in this excursion. Ethnographic Museum Etara situated along the River Yantra, which can be viewed at actual size with its Bulgarian houses from the 18th and 19th century. Can drink coffee made on hot sand and eat white sweet, to see the working craft workshops. Lunch at the museum in a typical Bulgarian pub (called han). Again crossing the mountain. On the road opens amazing views towards the planes. At the foot of the mountain was built a beautiful Russian church. The golden dome is visible from miles away. This church in the village of Shipka is a monument dedicated to fallen Russian soldiers during the Russian-Turkish war 1877-1878 year. It was built in the style of Russian churches from the 17th century. Its walls are covered with beautiful frescoes. A few kilometers from Shipka starts the Valley of the Kings. There is also the Thracian tomb”Goliamata Kosmatka”. Archaeologists reveal it several years ago. It was buried Seuthes III. This monument of the Thracian civilization is 2500 years (5th century BC). There are questions about its construction, which still awaits an answer. Visit of the Thracian Tomb of Kazanlak (4-th century BC). Unknown artist of old times used 4 main colors and 2- painting techniques. This tomb is included in UNESCO World Heritage Site. Kazanlak is located in the center of the Rose Valley. Here is produced 80% of the world production of rose oil, which is in the base of the highest quality perfumes. For centuries, roses have been the basis for the livelihood of this region. Departure to Plovdiv - the second largest city in Bulgaria. Accommodation at Hotel Dedeman Trimontium 4 *. It is located in the center of Plovdiv town. Day 6 – Breakfast. Plovdiv. Walking tour of the city. Plovdiv is one of the oldest cities in Europe. It was founded before Athens, Rome and Constantinople in the time at which was based and the ancient city of Troy. There are artifacts of Thracian civilization. The Thracians were famous in the ancient world for its wines, which were declared as the best. The period during which Plovdiv has been within the Roman Empire was marked by the construction of many large public buildings like an amphitheater (late first and early second century of our era). And nowadays it is used for performances and outdoor concerts. Other major monuments of Roman civilization are the Roman Forum (2nd century BC) and Roman stadium in length of 180 meters and with 30,000 seats (second century of our era). At that time the name of the city was Trimontium, which means "town on three hills." Bulgarian history is presented in the old town of Plovdiv with the big beautiful houses of 18 -19 centuries. They are evidence of the economic power of the city during this era. At that time Plovdiv compete with Thessaloniki and Istanbul. The walk along the narrow cobbled streets between high walls and overhanging second floors take us back in time. In many of these houses are now occupied exhibition halls, shops and restaurants. Dinner at one of these restaurants. Day 7 – Breakfast. Early departure to Istanbul (420 km). You will cross the Thracian Valley. The Turkish border is about 144 km from the town of Plovdiv. The European part of Turkey represents 3% of the territory of the country. The main town is Edrine. Situated near the Greek (7 km) and Bulgarian (20 km) borders, this city is famed for its many mosques, domes and minarets. Adrianople contains the ruins of the ancient palace of the Ottoman Sultans and the Selimiye Mosque, one of the most important monuments in this ancient province; built in 1575 and designed by Turkey's greatest master architect, Mimar Sinan, it has the highest minarets in Turkey, at 70.9 meters and a cupola three or four feet higher than that of Hagia Sophia Mosque in Istanbul. Arrival in the hotel in Istanbul ( 4* hotel ) in the beginning of the afternoon . Start a leisurely day, visiting the historical Spice Market, and continue by boat for an excursion along the Bosphorus. After lunch, drive to the Asian side via Bosphorus Bridge and visit Beylerbeyi Palace & Camlica Hill. Return to hotel, Overnight Istanbul (Includes Breakfast and Lunch). Take a full day classical tour of Istanbul, including the ancient Roman Hippodrome (center of the chariot races) and the Blue Mosque.We continue on to Topkapi Palace, St. Sophia Museum, and the historical Grand Bazaar. Overnight in Istanbul (Includes Breakfast and Lunch). After breakfast transfer to airport for your return flight home.